We have previously noted the presence in the Shenmue world of old red 14-inch TVs, which are often found sitting in the corner of Chinese Restaurants as outlined in this Shenmue design document. 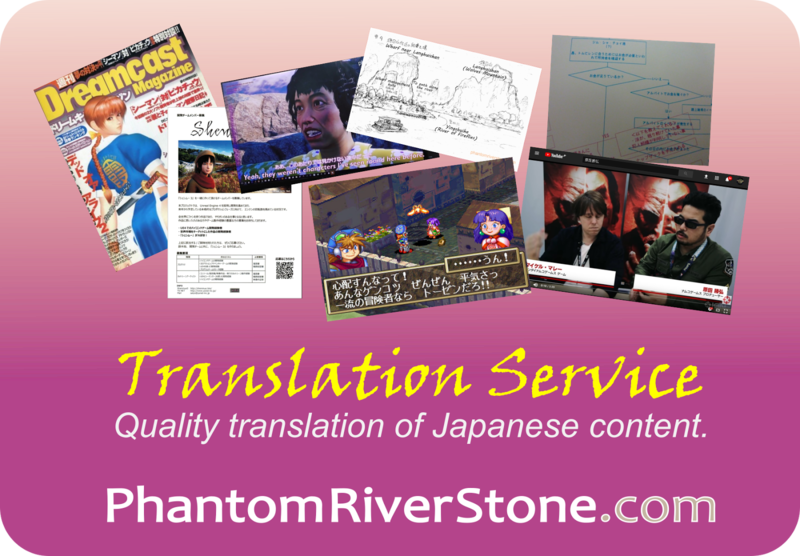 It turns out that there are many more of them in the games than one might casually imagine. In this collaboration post, we present a definitive survey of all such red TVs throughout Shenmue 1 and 2, based on the results of a thorough investigation by regular reader JCGamer who has tracked down and logged every appearance! 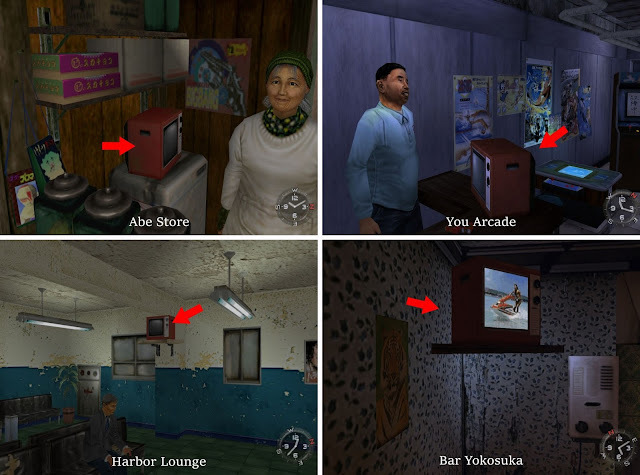 Apart from being found in the Chinese restaurants in Dobuita, the red television also turns up in a few other locations in the first game. 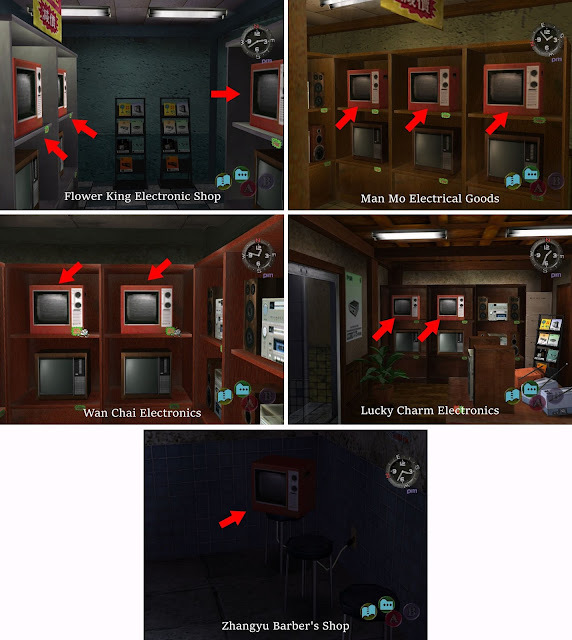 (It seems that Abe-san catches the daily soaps on a set behind the counter of the Abe Store). Hong Kong is where the bulk of the red televisions are to be found. There is only a couple to be found in Aberdeen, both being sold at the single pawn shop on Queen's Street. The price is HK$3200 i.e. equivalent of 640 cans of soda, but as you might expect from being located near the port this is somewhat pricey and there are better deals on offer further on in the game. 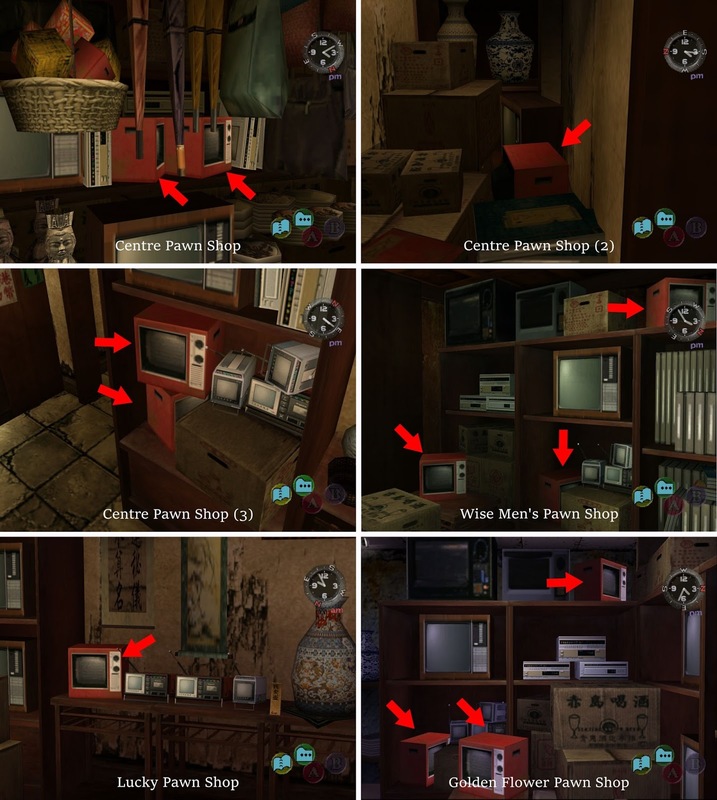 Although the layout of items in the two screenshots below is very similar, they are different areas of the shop. The owner of Good Omen Butcher has a red TV (but not his rival at the Healthy Meat Shop next door - a point to Good Omen for this round of their ongoing spat!). The red TVs get special treatment at the Carmain Pawn Shop where two are displayed in the show window. 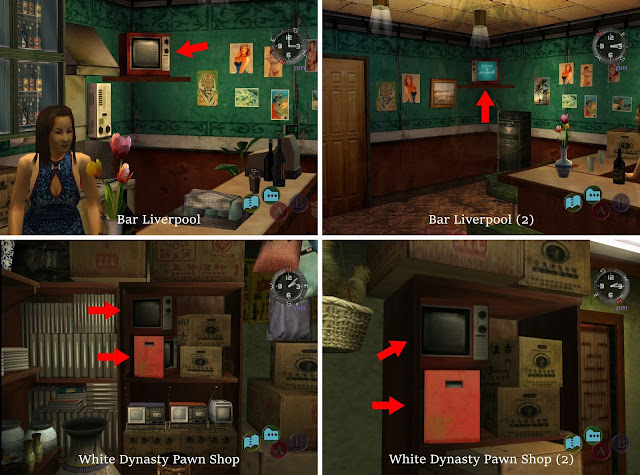 Bar Liverpool has two red TVs, with the one that is on displaying that karaoke hit favorite, "Legend of Shenmue II", ready for someone to grab the microphone. 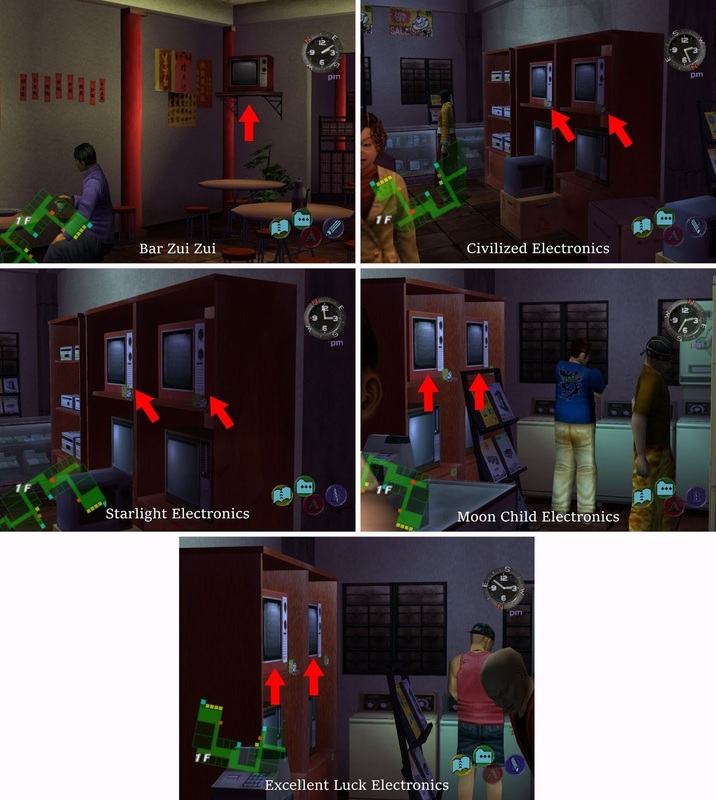 It can be seen that the karaoke TV has its controls on the left-hand side of the screen, the opposite to all the other TVs in the game. The White Dynasty Pawn Shop is overstocked, with four in total wedged into the shelves. The Lucky Charm Quarter is where many of the electronics shops are located, offering brand new red televisions for HK$1780, almost half the price of Aberdeen. The Wise Men's Quarter in Wan Chai may be the place to visit if you want to haggle for a cheap red TV - some of the pawn shops have three sets that look as though they may have been sitting there for years. A TV set sits high on the wall of these two restaurants in the Dimsum Building in Kowloon. 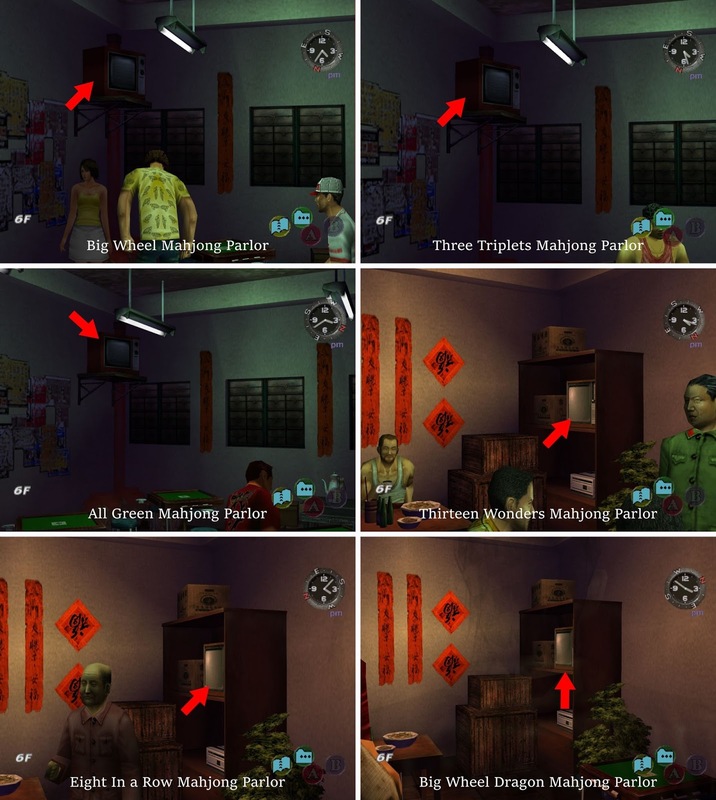 It would seem the restaurant owners have copied each other's decor very closely, as can be seen by the near-identical interiors in these screenshots - although at least the table colors differ. There's no price visible on the televisions for sale in the Moon Child building, but green stickers advertise "20% OFF" whatever the original price may be. That wraps up this gallery of a grand total of 57 red TVs. 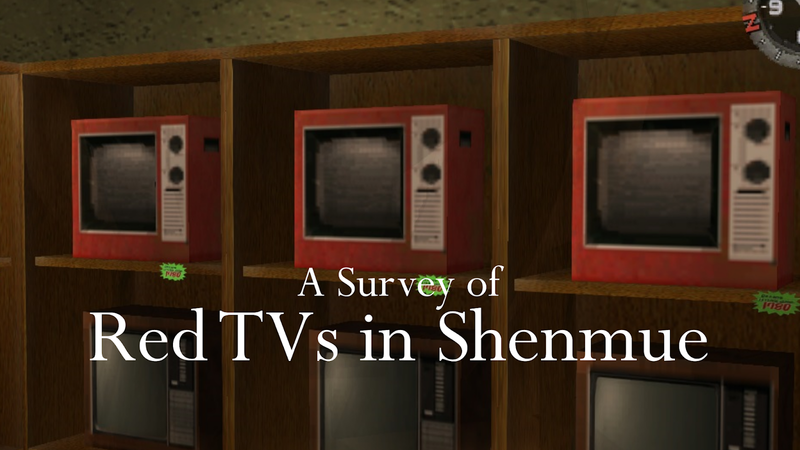 Will the red TV show up again in Shenmue 3 - or will there be another such ubiquitous object dotted through the villages and towns of Guilin? 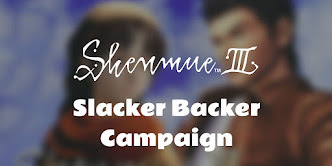 Either way, JCGamer says he is “looking forward to finding more Shenmue-esque objects in future titles." If you come across any other red TVs in the game that have not been covered so far, drop a note in the comments! Amazing! So many red TV's!! 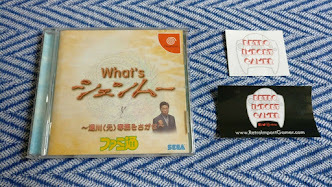 Legend of Shenmue II is a favourite of mine when hitting up the karaoke bars. Tee hee, you have good taste! Oh yes! Also a classic.